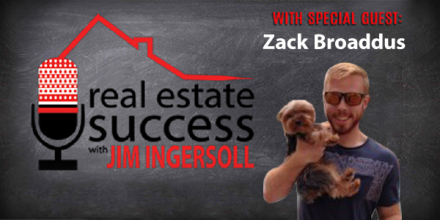 In this week’s Real Estate Success podcast, your host, Jim Ingersoll talks to Zack Broaddus about creating lifetime income streams from real estate assets. Born and raised in Richmond VA, Zack eats, sleeps, and breathes real estate. You can find him either working diligently on his next deal or enjoying the outdoors with his dog, Bentley. Zack created his real estate solutions company, RVA RealEst. immediately after graduating from Randolph-Macon College in order to help the community with all of their real estate needs.